BANGKOK: Companies in Bangkok are allowing workers, especially those sick or pregnant, to work from home to avoid exposure to toxic PM2.5 dust. With schools closed this week, both the private and public sectors are attempting to safeguard the most vulnerable from the unprecedented pollution. Banks are letting employees work from home as long as it does not disrupt operations and affect customers. Bank of Ayudhya (BAY), Siam Commercial Bank, Kasikornbank, Krungthai Bank, GH Bank and Government Savings Bank are allowing pregnant workers and employees with allergies to work from home. Some banks are offering the privilege to employees who need to take care of children home from school due to pollution. Workers at BAY’s head office at Ploenchit Tower were allowed to change their lunch hours to reduce congestion at the canteen. Vitai Ratanakorn, Secretary-General of the Government Pension Fund (GPF), said the fund adopted a temporary work-from-home policy for pregnant women and employees affected by the dust, even those without medical certificates, as there is an IT system to complete daily tasks. “As the leaser of three buildings located in Bangkok’s business districts, the GPF manages air quality in these buildings through ventilation and testing,” Mr Vitai said. BBL Asset Management, the Stock Exchange of Thailand and retail groups MBK and Central Group also announced a work-from-home policy for some employees this week. Pattera Dilokrungthirapop, chairwoman of the Association of Securities (Asco), said the association will discuss the work-from-home policy next week. Since securities trading has to be conducted in accordance with customer demand and in line with the SET’s operating hours, the policy could affect customer service, Mrs Pattera said. 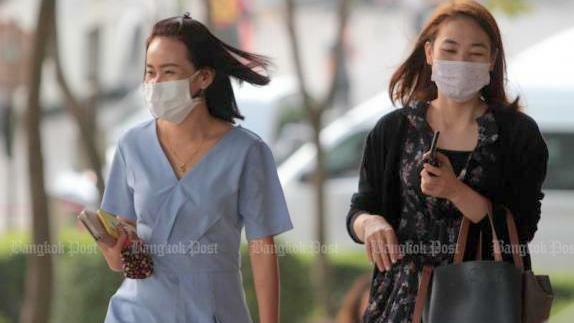 Securities executives are formulating contingency plans to continue business operations amid Bangkok's worsening air quality, such as providing masks, examining air quality in workplaces and allowing employees vulnerable to dust particles to take leave or work at home, she said. The Governor of the Electricity Generating Authority of Thailand (Egat), Viboon Rerksirithai, said he is concerned about the safety of all employees, especially those working in the central region, namely the Egat head offices in Bangkok, Phra Nakhon, Wang Noi and Nakhon Thai. Egat has distributed safety masks to employees for safety and advised them to check air pollution levels online, as Egat monitors the level of dust particles in the central region 24 hours a day. 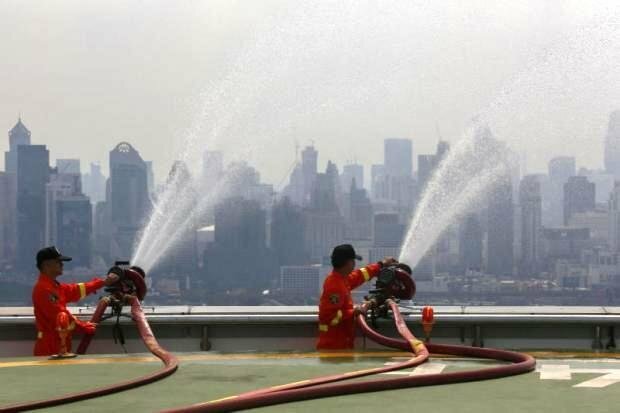 Egat plans to install water sprays at its buildings in an attempt to reduce smog in the central region. Yuttana Jiamtragan, vice-president for corporate administration at Siam Cement Group, said the company has distributed N95 safety masks to the employees. The company advises employees to wear the masks when outdoors and 10-15 minutes after going indoors. SCG is also letting employees work from home if they cannot commute. Meanwhile, Prime Minster Prayut Chan-o-cha has asked motorists not to use diesel-engine cars in Bangkok and neighbouring provinces, in a bid to lower ultra fine dust that shows few signs of subsiding. Harsh measures such as school closures, and use of water canons brought down PM2.5 levels slightly yesterday (Feb 1). The Pollution Control Department (PCD) warned levels still exceed the safety limit, forcing Gen Prayut to beg the public for more cooperation. “Dear Thai people,” the prime minister began his request, “despite a raft of short-term solutions, the PM2.5 situation has not improved. The persistence comes from diesel engine emissions in Bangkok coupled with the stagnant weather. The government wants to ask people for their cooperation in not using, or limiting their use of diesel engines for a certain period of time in Bangkok and its nearby provinces,” Gen Prayut said. It is obvious the combustion of bad diesel engines has contributed most to the surge in dust levels, he said, adding factories are not the culprits because inspections show none produce PM2.5. PM2.5, fine dust measuring 1/20 of the width of a human hair, can easily lodge in the lungs. The government has tried many measures to curb PM2.5 levels from cutting down on black smoke-belching vehicles, creating artificial rain, spraying water on the streets to calling a two-day break for schools in Bangkok to reduce traffic congestion. Private companies have now started letting their employees work from home. The efforts bore fruit but have not been enough to make Bangkokians breathe without fear. More people are wearing masks and are trying to keep their outdoor activities to a minimum. Some have even bought air purifiers. PM2.5 levels have dropped, but not significantly. The PCD and weather monitoring websites say air quality in Bangkok still exceeds safe levels, posing a potential risk to vulnerable groups such as those with health problems, the elderly, pregnant women and young children. Airvisual.com reported that on Friday PM2.5 soared to 146 microgrammes per cubic metre (µg/m³), against the country’s safety level at 50 µg/m.³ However, the PCD expected air quality will improve today (Feb 2), given better weather conditions. The PCD said it would ask the National Environment Board to approve more urgent action plans to fight PM2.5. If the NEB approves, the department will ask the cabinet to okay the steps at its meeting on Tuesday. Among the measures are banning large trailers from the capital's middle zone around the clock until March, using cleaner petrol, and allowing state officials to work at home. Read original stories here and here. In 4.0 Countries there are car exhaust pipe emission laws. Does the 'over-lawed' Thailand has that? General PM only makes a plea? So powerless when it comes to the health issues of his nation? In election rule dictating he is acting much stronger. ( no pleas). The guidance figures are 20 μg/m3 for the annual mean and 50 μg/m3 is the 24-hour mean. SOME of it comes from diesel engines, some from gasoline engines and some comes from industry and waste disposal. Crucially, of what polution does come from diesel engines more than 90% comes from less than 10% of vehicles, a situation which would be addressed by proper enforcement of existing emissions regulations. Stop fooling the Nation ( Thailand) with that fake safety level of 50 ug/m3! The international safety level is: 25 ug/m3. Anything above is health threatening.